Posted on May 17, 2018 at 5:32 am. The SOLs continue today — with several different tests. All 7th graders will be taking the Civics and Economics exam; while all 8th graders will be taking the Science exam. Here’s a look at the testing schedule for May 17th…. 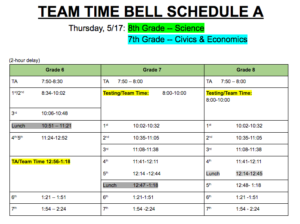 We will be following “Team Time Bell Schedule A” — with 7th and 8th graders testing from 8 to 10 a.m., and 6th graders following the adjusted ‘A’ schedule beginning at 8:34. Testing locations are listed on the call-boards by the cafeteria, and auditorium, or you can check with your TA teacher. And for all those students who are NOT testing today — please remember to be quiet and respectful in the halls. Teachers will be monitoring the hallways to ensure that there are no disruptions. Any other questions or concerns? Check with your teachers or grade level counselors. Good luck on your SOL, 7th and 8th graders! Did you get a good breakfast today? On EVERY scheduled SOL testing day from now until June, the WMS cafeteria will be offering a FREE BREAKFAST to all students, from 7:25 to 7:50 a.m. It’s a FACT that a healthy breakfast fuels both your body AND your mind. So give yourself the best chance for success, and EAT YOUR BREAKFAST!! It’s Day 4 of Teacher and Staff Appreciation Week — and today, we’ve got something that’s near-and-dear to every teacher’s heart: FREE FOOD! Be sure to stop by the Teacher’s Lounge TODAY for your complimentary “lunch on-a-stick” — courtesy of Moby Dicks. And as always: THANK YOU, TEACHERS!! The WMS Kindness Club will be meeting TODAY during ASP 1 in room 134. Participants will be starting construction on their special school project — and there’s plenty of work to go around. And of course, new members are always welcome to join! See Mr. Johnson, Ms. Schaefer, or Ms. Zeller with any questions. Calling all MUNners! An important change of plans for you to be aware of. There will be a REGULAR MEETING this afternoon during ASP 1 in room 202. Meanwhile, the Model UN’s end-of-the-year celebration is being RESCHEDULED for a later date. More information about the party will be coming soon. See Ms. Carlson with any questions.